This poem first appeared in print on the cover of The Living Church in 1993, and on this blog in 2006. 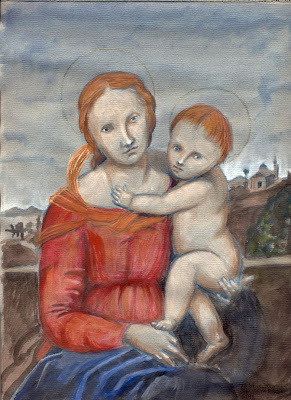 The image is a watercolor and pencil sketch after Rafaello, executed in Lent this year, which I've called "Blue Madonna." Lovely and moving, Tobias, both the icon and the poem. It seems I was not alone in pondering the Incarnation during Lent. Tobias, now that you mention the family resemblance, it's plain. The icon and the poem served as a wonderful morning meditation, and I thank you for them.